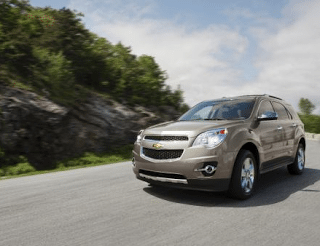 In May 2013, for the first time since last October, General Motors Canada reported a year-over-year Chevrolet Equinox sales increase. The Equinox and its twin, the GMC Terrain, combined for 3315 sales in May, good enough for fourth spot in the category, behind the Toyota RAV4, Honda CR-V, and class-leading Ford Escape. General Motors also sold 803 copies of their smallest crossovers, the Chevrolet Trax and Buick Encore. 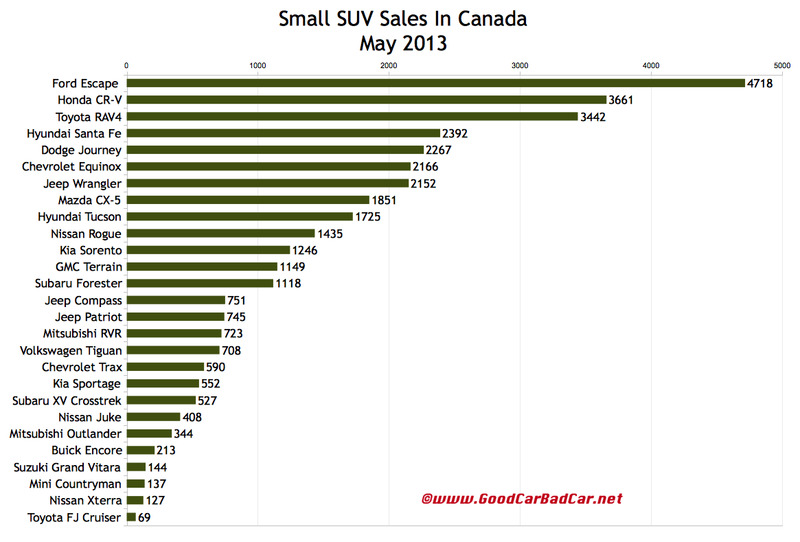 All four nameplates combined for 4118 sales in May, or 600 fewer sales than Ford Canada managed with the Escape. Sales of the Encore dropped 68% from April to May. Trax volume fell 35% during the same period. With 1851 sales in May, Mazda Canada broke its two-month-old CX-5 sales record. Although the American new vehicle market was nearly eight times larger than the Canadian market in May, and though SUV and crossover sales were more than eight times as strong in the U.S., sales of the CX-5 weren’t even four times as strong in America as they were in Canada. If Mazda USA produced the kind of market share that Mazda Canada does, they’d have sold closer to 275,000 vehicles in America so far this year, rather than 122,447. The CX-5’s acceptance in Canada plays a large role in Mazda’s northerly success. It’s Canada’s eighth-best-selling utility vehicle so far this year. The CX-5 ranks 23rd in the U.S.
You can click any model name in the tables below to find historical monthly and yearly Canadian sales data. You can also select a make and model at GCBC’s Sales Stats page. These tables are now sortable, so you can rank small SUVs any which way you like. Suggestions on how GCBC should break down segments can be passed on through the Contact page. 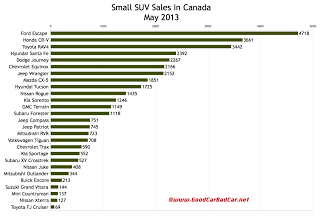 ^ not including 331 Santa Fe XL sales (623 YTD) which are shown exclusively in the midsize SUV category. GCBC isn’t here to break down segments, an impossible task for any group, but to display sales data for the sake of comparison. The more ways sales data can be displayed, the better, right? This explains why you’ll see the Santa Fe and Sorento listed with midsize SUVs – they’re stuck in between in terms of size – as well as vehicles like the Wrangler and Xterra listed both here and there. The Buick Encore and Subaru XV Crosstrek and their gang are also listed with mainstream cars, because they’re sitting on a fence between SUVs and traditional passenger cars. You can always find the sales results for EVERY vehicle and form your own competitive sets by using the All Vehicle Rankings posts.